If the sound of the sea is your favourite sound to wake up, you should definitely stay in one of our holiday rentals by the sea. These are located in walking distance from the beach, restaurants and shops. Are you away most time or at the beach? 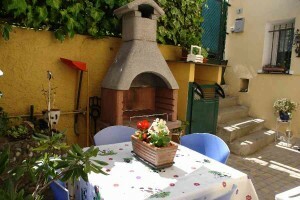 Do you travel with just a few people and need cheap vacation accommodation by the sea in Liguria? 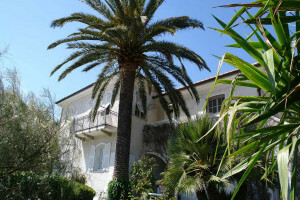 If you are comfortable with making the journey to the holiday destination by train or by car, then we at BlumenRiviera have just the right selection of holiday apartments for you! 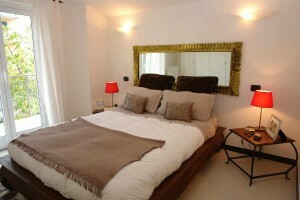 Most of our holiday apartments have a good connection to the road network, they are not far from shops selling daily groceries and you can choose between favorably priced apartments with simple furnishing and luxurious suites which are functionally furnished. 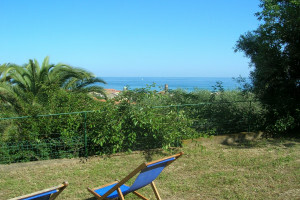 From your holiday apartment you can get to the beach easily and quickly within a few minutes on foot, by bicycle or by car and proceed to discover the uniqueness of the Ligurian coast. 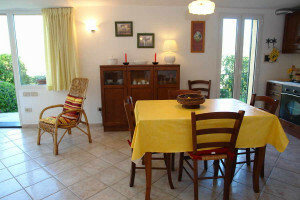 We shall be glad to personally help you with your search for the suitable holiday apartment or the right Agriturismo at the Ligurian coast. The Ligurian Riviera, with its variety of possibilities, be it sporting, cultural or culinary, is a true paradise for those who love discovering. 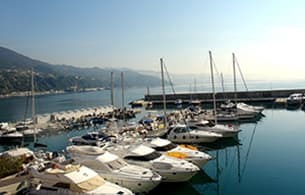 You can get to all tourist destinations in the neighborhood pretty quickly: discover the beaches of the four provinces of Imperia, Savona, Genua and La Spezia, and let yourself be filled with enthusiasm by the varied nature of the Ligurian coast. 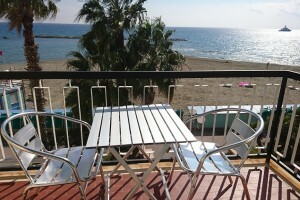 The sandy beach in Diano Marina, Santo Stefano al Mare, Andora or Alassio is particularly very popular with families. 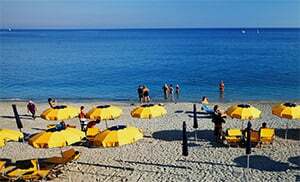 But even romantic small localities like San Lorenzo al Mare, Riva Ligure or the resorts of Cinque Terre with their rock and gravel beaches have their own special attraction. The numerous coastal sections from La Spezia to Ventimiglia with a fine sandy beach, rock beach or gravel beach are a perfect invitation for you to take a swim or to relax. There are many different offers for water sport – fans too, such as windsurfing, water surfing, kite surfing, sailing or fishing. The railway line was already transferred in many places from the coast to the hinterland and wonderful bicycle tracks that are removed from traffic noise developed on it, along which several bicycle rental companies are offering a variety of bikes for rent. 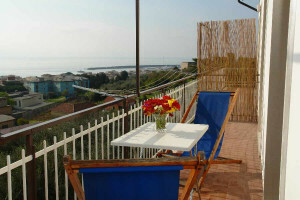 We recommend that you take a day‘s trip on a bicycle by all means from San Lorenzo al Mare to San Remo. 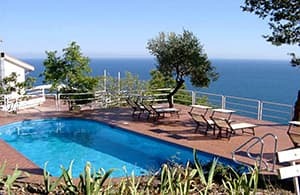 Liguria, located at the North Italian coast, offers you direct contrasts with its Italian charm: Mountains and the sea, large beach pools and isolated bays. It is precisely during off-season that you will have beautiful endless beaches to yourself alone. You can also pamper yourself with unlimited variety in as far as culinary offers are concerned. After a relaxed day at the beach you can then go and plan your next activities in the surrounding region from the comfort of your holiday apartment: whether it is a visit to the sea aquarium in Genoa, a shopping day in Alassio or Savona, walking trips in La Spezia, or a visit to the olive oil museum in Imperia, the localities in Liguria are as varied as the coastal region itself. It is therefore worth your while to rummage through our Holiday House and Holiday Apartment Catalog and to find and rent that holiday apartment directly by the sea which best suits your needs! It is better you first enter the desired time period for the vacation, the number of persons and the number of bedrooms, after which you will get a list of the search results with all the free domiciles, and you can then put a checkmark against all the criteria applicable to you under "More options", thereby quickly arriving at an overview of the holiday apartments still available instead of searching endlessly. 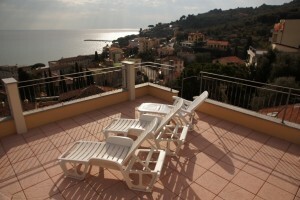 Anticipation of vacation in Italy begins already when you book one of our holiday domiciles overlooking the sea. 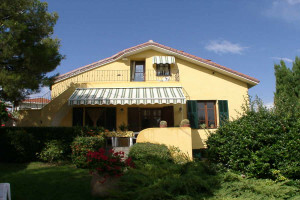 The BlumenRiviera team will be pleased to advise you in detail when selecting holiday houses and holiday apartments. Whether you need an apartment with only one bedroom or more, one which is within walking distance of the sandy beach or holiday apartments in more quiet locations in the hinterland and yet close to the sea – we shall recommend for you properties which match your desires. And we shall also give you one or the other insider-tip on beaches.